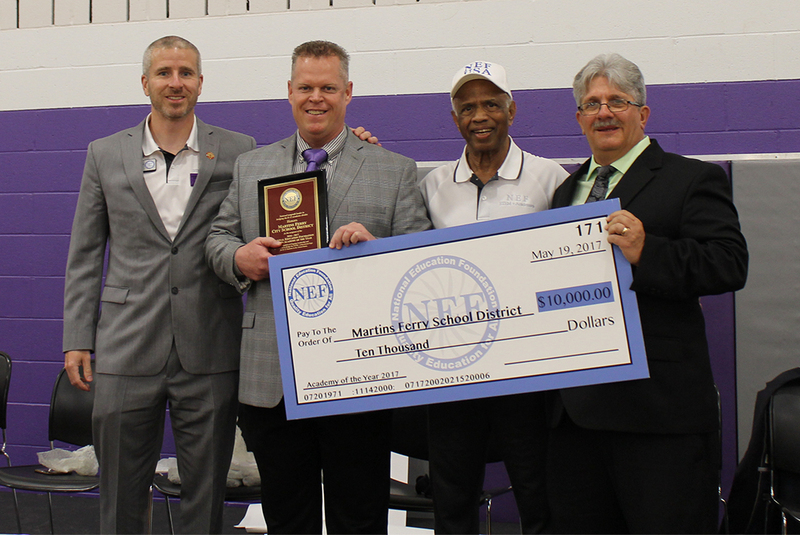 WASHINGTON, May 25, 2017 /PRNewswire/ — National Education Foundation (NEF), the national nonprofit leader in holistic STEM education solutions, awarded its 2017 STEM Leadership Award for $10,000 to Martins Ferry City Schools, OH, on May 19, 2017. The STEM (Science, Technology, Engineering, and Math) Leadership Award celebrates the exemplary implementation of NEF’s STEM+ Academy by a school district that motivates its students toward acquiring 21st century STEM skills, both academic and hands-on. Martins Ferry students advanced a remarkable one grade level in math and reading in 29 and 27 learning hours respectively. The students also earn college credits. Martins Ferry’s success stands out as a clear example of how to cost-effectively improve student achievement by involving and motivating all the stakeholders — students, teachers, parents, and administrators. Martins Ferry successfully implemented NEF’s STEM+ Academy (STEM, reading, social studies, SAT/ACT, IT, career tech, business and personal/professional development) holistic system solution that includes personalized learning using top-rated online courses, teacher training, a state-of-the-art learning management system, teacher stipends, student awards, parent training and tech support. NEF’s STEM+ Academies have been implemented in school districts across the U.S. by the State University of New York (SUNY), the largest university in the U.S., in partnership with local universities, with students eligible to receive college credits from SUNY, NEF’s academy partner, for $60 per credit, with a 90% subsidy. 75-year-old NEF Chairman and philanthropist, Dr. Appu Kuttan, was challenged by Martins Ferry students and staff to a fitness contest. Dr. Kuttan won the contest with 30 students and teachers and donated the $1,000 winner’s prize to Martins Ferry to start a fitness program for students in 2017-18. In addition, Dr. Kuttan announced national STEM design contests for K-12 students to start next school year. Contest winners will earn scholarships. Merit cash awards were also presented to schools in Canton, NY, Steubenville, OH, Lehighton, PA, and Warren County, PA. In addition to this annual award, NEF provides significant matching grants to disadvantaged school districts/schools nationwide. Martins Ferry’s STEM+ Academy was fully funded by the Federal QZAB (www.qzab.org) program and NEF’s significant matching grant. NEF’s STEM+ Academy, with its attractive motivational rewards, provides a well-rounded educational experience for students of all grade levels. The National Education Foundation (NEF), winner of the 2016 Global STEM Leadership Award from the prestigious World Economic Forum, is the national non-profit leader in bridging the academic and job skills divides by providing world-class STEM+ (Science, Technology, Engineering, Math, English, test prep, digital literacy, career tech, IT, business, management and personal/professional development) education to millions of disadvantaged students and adults. See www.stemgrant.org. The Qualified Zone Academy Bond (QZAB) program is a federal program that provides qualified schools with funds for energy programs, STEM, renovations, and technology. See www.qzab.org. Through the STEM, QZAB and Adopt-A-School national grant programs, NEF and State University of New York (SUNY) have created the most cost-effective, high-quality holistic STEM+ education solution. There are STEM+ Academies in 20 states and several major cities. NEF’s ultimate goal is to provide STEM+ education to students in most disadvantaged school districts in the U.S. by 2020. Our QZAB STEM+ Academy (mandated by the Law): We have helped more students receive world-class STEM+ education via the best QZAB STEM+ Academy by the State University of New York than all other entities put together – a student advances a grade level in 20-30 learning hours and earns SUNY college credits for $60, with a 90% subsidy! © 1989-2016 NEF All Rights Reserved.